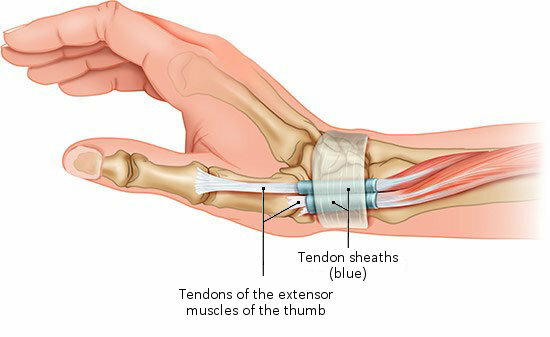 Heavily used areas of tendons are covered by a protective tendon sheath. If a tendon sheath becomes inflamed, it is known as tenosynovitis. Tendons connect bones and muscles with each other, they pass on the muscle power, allow your body to move and provide stability. Some areas of tendons – such as areas that cover protruding bones – are protected by tendon sheaths made of connective tissue. Tendon sheaths are filled with a lubricating fluid, so tendons can easily slide through them. If a tendon sheath is overused, it can become inflamed and swollen. Sometimes the tendon becomes swollen too. 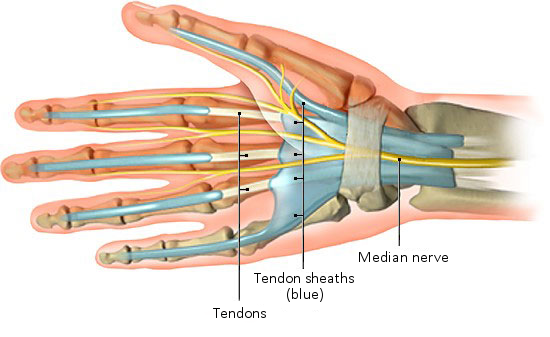 The medical term for a tendon sheath inflammation is tenosynovitis. This kind of inflammation can be very painful and greatly reduce movement in the affected part of the body. It most commonly occurs in the hands, arms and feet. At first, the affected area often only hurts when you move it. It is then important to rest that part of the body so as not to make the symptoms worse. Tenosynovitis typically causes pain, particularly during movement. The inflamed area may also be swollen and sensitive to pressure. After some time, tenosynovitis might hurt without movement, too – for instance, at night. The painful inflammation sometimes causes the tendon sheath tissue to become stuck together in places. The tendon can then no longer slide through the sheath smoothly. Instead, movements are accompanied by a noticeable rubbing, grating or grinding feeling. Tenosynovitis can cause the sheath to become too narrow, making it hard to move the affected area freely. Known as stenosing tenosynovitis, this is particularly likely in the wrist and fingers. If it affects the wrist or thumb, it’s known as De Quervain’s tenosynovitis. If it affects the tendons that make fingers bend, it can lead to a condition known as “trigger finger,” where it is difficult to straighten out your finger again after bending it. The tendons on the palm side of the fingers are normally held in place by arch-shaped ligaments known as “annular ligaments” or “A pulleys.” In trigger finger, the tendon and/or tendon sheath there is swollen, forming a small lump. When you bend the finger, this lump slides down through an annular ligament. If you then try to straighten your finger again, you need more force in order to pull the lump in the tendon back up through the annular ligament. This usually happens abruptly – the finger suddenly snaps back into the straight position. It is estimated that about one third of all people who have trigger finger also have carpal tunnel syndrome at the same time. Tendon sheath inflammations can irritate nearby nerves, too, leading to problems like abnormal sensations. Tenosynovitis is usually caused by unfamiliar or frequently repeated movements involving the affected tendon or tendon sheath. For instance, walking or running long distances without training beforehand, or wearing unsuitable or new shoes, can lead to tendon sheath inflammations in the feet or lower legs. Some jobs or hobbies are associated with a higher risk of tenosynovitis. For example, working at a computer for a long time or playing a musical instrument a lot can put strain on the fingers, wrist and forearm. Tenosynovitis in the wrist is often caused by repeating movements that involve stretching your thumb out and away from the other fingers – for instance, writing on your smartphone a lot, or lifting and carrying a child around a lot. The likelihood of having inflamed tendons (tendinitis) or tenosynovitis is also greater in people who have diseases like diabetes, rheumatoid arthritis and gout. These inflammations are more common in women who are pregnant or breastfeeding, too. Germs such as bacteria usually aren’t involved in tenosynovitis. Tenosynovitis is common, particularly in the hands and wrists: For instance, 2 to 3 out of every 100 people have a trigger finger at some point in their lives. Tendon sheath inflammations tend to be more common in women. Tenosynovitis generally clears up within a few weeks if the affected area is kept as still as possible. Tenosynovitis can usually be diagnosed following a brief doctor’s examination. After talking with you, the doctor looks at the painful area and feels it. He or she also checks which movements trigger the pain or make it worse. In most cases, further examinations or tests aren’t needed. If it is thought that a different medical problem could be causing the symptoms, you may also have blood tests or scans such as an ultrasound scan or x-ray. The main purpose of blood tests here is to find out whether the symptoms are being caused by a bacterial infection. Tenosynovitis is usually treated conservatively (without surgery) at first. This mainly involves resting the affected area. It's still important to avoid overusing it once the inflammation has gone away, too, in order to prevent the inflammation from coming back. If the tendon sheath inflammation was caused by a work-related activity, it can be a good idea to make changes in the workplace, such as using an ergonomic mouse for computer work. If you aren’t sure whether making changes would be helpful, you can ask for advice – for instance, from an occupational health specialist. Wearing special braces or plaster casts can help keep the affected part of the body still. Other things that can help include physiotherapy – such as stretching exercises and massages – and anti-inflammatory painkillers. If these treatments don’t help, doctors can try to relieve the symptoms by injecting a local anesthetic and a steroid. Surgery is sometimes considered too. This involves removing or cutting the obstructing tissue to give the tendon more room to move again. How can tenosynovitis be treated?